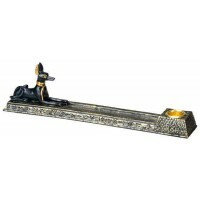 Horus sits regally at one end of this incense burner with deep well for ash catching. 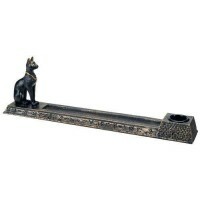 Black cold cast resin ash catcher has a long channel to catch the ashes of your favorite incense sticks. The Egyptian God Horus sits at one end with Eye of Horus at the other end and heiroglyphics covering the sides. Measures 10 1/4 inches long. Item Number: PT-10569 | Approximate Size (Inches): 10.25 wide x 1.34 deep x 3.50 high | Approximate Shipping Weight: 1.00 lbs. Amun-Ra was the Egyptian God of Kings and King of Gods. The oldest and long..
Osiris, the Resurrection God, is the central figure in the afterlife myth. ..